For those who jump into the blogging world, they may find they have more options than they were expecting in terms of the different blog platforms. Although there are probably about half a dozen good platforms out there that I could name off the top of my head, the first two that pop up are probably the two biggest ones used: Blogger and WordPress.Of course there are users of both that feel they are right in saying their platform is better than the other, but this is one of those subjective opinions. Oftentimes in this situation, using the application and trying it out is the only way to really know. I have used both applications and have found there are things about both that I like better than the other. When you sign up for Blogger you can add your Google account to the blog and join the two. Because of this ability to connect them, you will be able to use other Google features such as AdSense, AdWords, and Webmaster tools. Does anything else need to be said? It’s Google. One of the largest and more powerful of the big internet companies, Google is what Google is. You should feel safe no matter what. Building every page made having a blog a lot of fun, especially with so much customization. My best advice is try them both out and see which you like better. 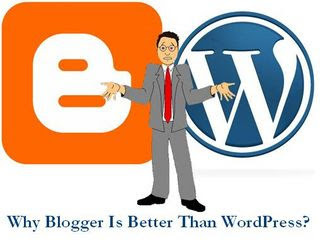 If you do, comment and let me know your choice: WordPress or Blogger? BlogSpot has great options to edit theme design and make it more attractive according to willingness. I couldn’t agree more 🙂 They own the search market and you can use their AdSense and AdWords which are not available for wordpress. Blogspot provides more freedom if you don’t want or can’t affort to host your blog. I agreed with you for the third point. Blogspot give you more flexibelity to costumize your blog. You can also edit the template like html and css which you cannot do it in wordpress. I am talking about the free service. But once you got your own hosting and domain, wordpress is the winner and best choice. If we are discuss it more deeper, we all know that wordpress is stronger. I am not gonna talk about it, if you tried wordpress before than you know what i mean. Btw, in many case, i found that google search engine loves blogspot more than wordpress. You’ll see more subdomain.blogspot in search result more than subdomain.wordpress. I am still wondering about this. Do you know why ? Yes it is a big plus but most bloggers apply for adsense even before they get good amount visitors.